So, just because it has gotten a little chillier out, doesn't mean that grilling season is completely over, right? At least for us, we grill until the grill is covered in snow. Ha! Before some of you start packing up your grill for the winter, I wanted to share one last grilling recipe with you. Although, you could technically cook the chicken on the stove top, but we'll just pretend that you can't at the moment. I know a salad recipe can be kind of boring sometimes, but I promise you, this one is far from boring and tasteless. As soon as I took my first bite, I was in heaven. Yes, this salad is worth being that excited about. I go through phases of really craving salads. At times, I find myself disappointed for all the work I put in chopping and prepping, to have a less than exciting salad. But, this salad will please just about everyone! It is worth the extra time marinating and cooking the chicken. And this makes the perfect light dinner. So go make it before all the summer veggies and herbs are out of season! 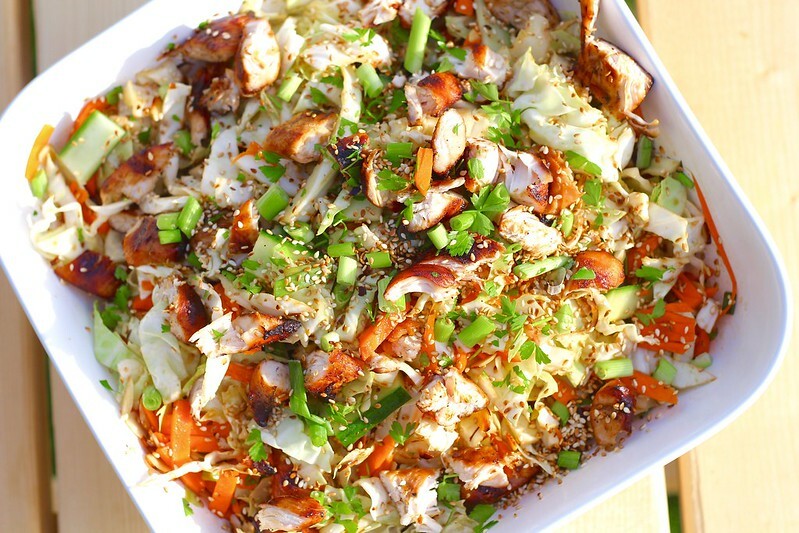 To make the marinade, whisk together the soy sauce, ginger, grapeseed oil, hoisin sauce, sesame oil in a small bowl. Add chicken breasts to a large ziplock bag and add 3 tablespoons of the marinade mixture, reserving the remaining. Seal the bag and shake so the chicken is covered with the marinade. Place in the refrigerator for at least 1 hour, or over night. 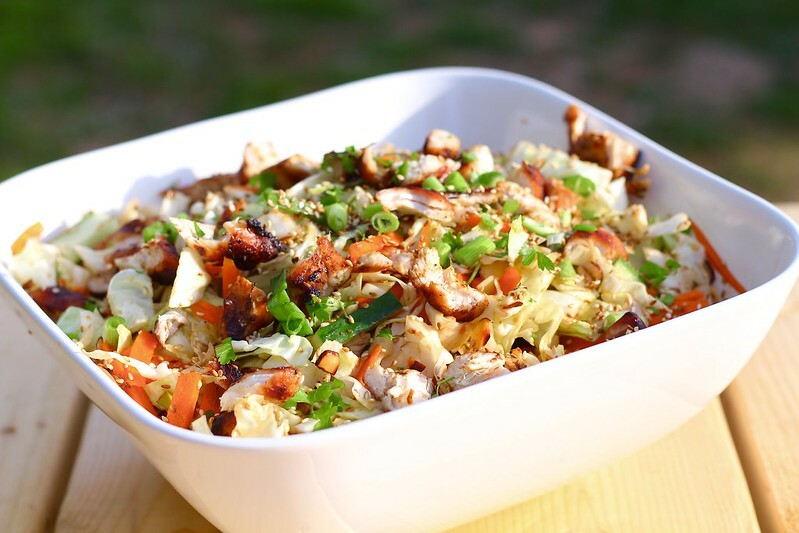 To make the dressing, whisk the red wine vinegar and 1/4 cup chopped green onions to the reserved marinade. Set aside until ready to use. Heat the grill on medium-high heat. Lightly oil the grill grates, then place marinated chicken on grill and cook until chicken is cooked through, flipping occasionally. The internal temperature should register 170 degrees F. Transfer to a cutting board and chop into bite sized pieces. 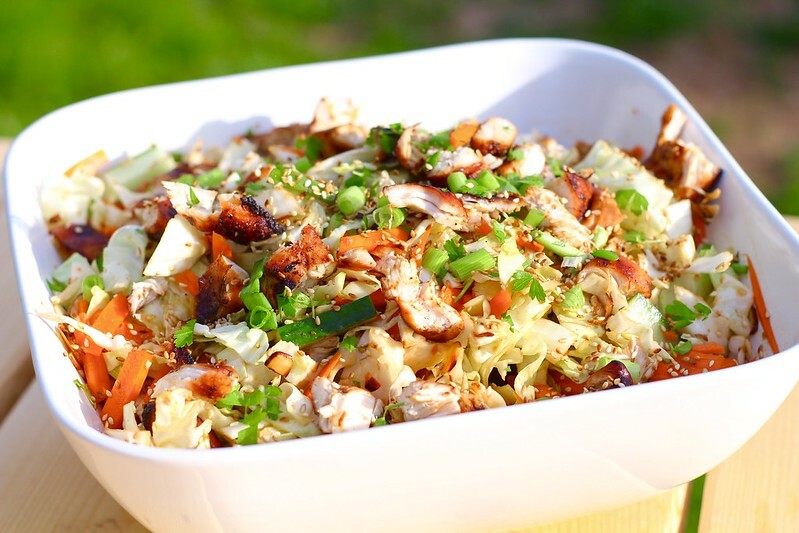 In a large bowl toss together cabbage, cucumbers, chicken, carrots, almonds, 3 chopped green onions, and parsley with enough dressing to coat salad. Sprinkle top with sesame seeds and serve.